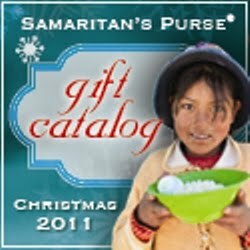 About the Children's Department: Put Feet to Their Faith with Samaritan Purse's Gift Catalog . . . Give an Alpaca! Put Feet to Their Faith with Samaritan Purse's Gift Catalog . . . Give an Alpaca! Christmas is a very big time of year for those of us in children's ministry because it is a very big time of year for children! Yes, it is the time of year to focus on the most amazing Gift ever . . . Jesus, but, if we are honest, most children are excited about Christmas because of the gifts they will find under their trees on Christmas morning. So, while it is inevitable for children will be excited about the gifts they receive, let's try to help them focus on and be excited about giving to others! Samaritan's Purse Gift Catalog make it so easy for us to do this . . . consider the following "gift" the children in your ministry could work to give to others in need this year . . . Gift #43 - Livestock - Suggested gift - $350 or Share the cost for - $35 . 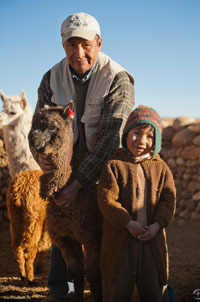 . . See how this gift helps families in Bolivia with their alpacas - "Most families in the highlands of Bolivia are livestock herders. They have been raising alpacas for generations, but the harsh conditions of the land present many challenges. The alpacas were always sick and many of them were dying. Parasites were getting into the brains of the animals, causing them to get thin, loose hair, and stop eating. Community health promoters trained by Samaritan Purse staff began going to each family to give anti-parasite medication and vitamins. They built seven pens so families could keep their livestock warm in the evenings when the temperature dropped, introduced high-quality males to the herds to improve the quality of the animals, and provided seed for nutritious fodder. Samaritan’s Purse also held training sessions in the community, coupled with Bible studies, for education and to teach the Gospel of Jesus Christ. (Which is THE most important thing they do!!!) They not only learned how to better care for the alpacas, but also about Jesus Christ. You can involve the children in your ministry in giving to others by raising money to send to Samaritan's Purse to buy alpacas for families in need in Bolivia. Not only will they be giving a gift which physically helps families, but they will be giving the opportunity for these families to learn of Jesus! There is no better Gift! Select a gift from the Samaritan's Purse Gift Catalog for the children in your ministry to work on and in so doing, Put Feet to Their Faith!